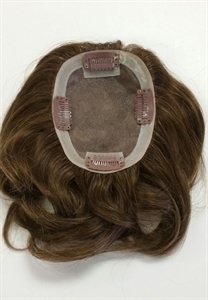 With the addition of human hair to this hairpiece, the availability of this item is divided up into light and dark colors. This particular item code and price reflects that of the light colors only. • Base size 3.75" x 5"
• 4 Clips sewn in for attachment, can be removed and base can be taped, glued or sewn into own hair (full polyurethane border). I ordered my first hairpiece from this website. I submitted questions via email and received quick responses each time. The hairpiece and the customer service were both first-class!